SwabTest guarantees the highest quality testing at the most affordable prices. We process thousands of cases every year for lawyers, physicians, the government, and private individuals. 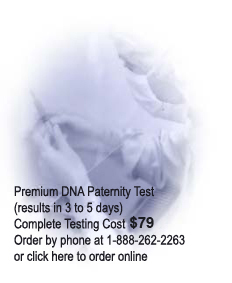 SwabTest is now offering discreet private paternity testing for only $99. Our $99 test is a premium DNA paternity test which guarantees >99.9% for inclusions and 100% for exclusions and is a much higher quality test than those offered by resellers who may even charge more. We provide a money back accuracy guarantee for every test that we perform. Kits are delivered to your door within 24 hours by courier or within 7 to 10 working days by mail. Each paternity test kit comes complete with all of the collection materials and instructions for you to take the test in the privacy of your own home. All paternity testing kits employ the buccal swab technique, allowing you to perform the collection within minutes with no fuss, no pain. Submit the DNA specimen directly to the laboratory after collection. DNA paternity test results are available within 3 to 5 business dayss (or as soon as 2 days for the express test) and can be obtained as soon as testing is completed using your secure order number and password online or by phone. Formal results documents are delivered to you by mail and / or e-mail. Are you using your results for legal proceedings? The private paternity test is ideal for families who need to know the truth regarding paternity for personal knowledge, or want to find out the truth before deciding what step to take next. Ideal for dads who have some doubt about the paternity of their child, and wants to check to make sure that the children are his. Suitable for mothers who need to know who is the father of her child. Adult children who need to find out who their true biological parents are.